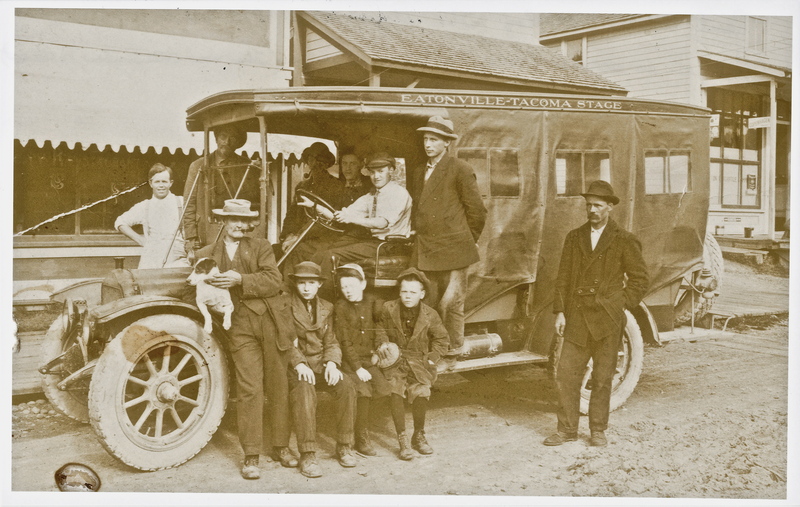 It’s hard to believe that the Eatonville to Tacoma Stage was a step up from the horse. This vehicle looks like it was built around 1915. Judging by the dirt road, the tractor-like shocks, and the not-too-snug cover, not to mention that these cars traveled at about 30 mph, it had to be one long, drafty and bumpy ride. On a completely different note, is that a baseball mitt on one of the boy’s hands? Photo courtesy of Jackie (Van Eaton) Parnell. This picture came from the Jackie (Van Eaton) Parnell family. Frank Van Eaton is driving the stage. Rick, his grand son, is providing us with several of the Parnell(Frank Van Eaton) family pictures next week. He also has many glass negatives he is going to share with us.